The origins of the greyhound are deeply rooted in ancient history. Murals and paintings of the dogs strikingly similar to today’s greyhound first appeared over 4,000 years ago. The ancient Egyptians so admired their physical attributes and speed that the greyhound was the only dog permitted to share their tents and ride atop their camels. Their likenesses can be found in the tombs of Pharaohs, who rated them first among animals — including pets and humans. In early Arabian culture, the birth of a greyhound ranked second in importance only to the birth of a son. In Persia, Rome and Greece, the greyhound enjoyed similar stature. It is the only canine mentioned in the Holy Scripture (Proverbs 30:29-31). 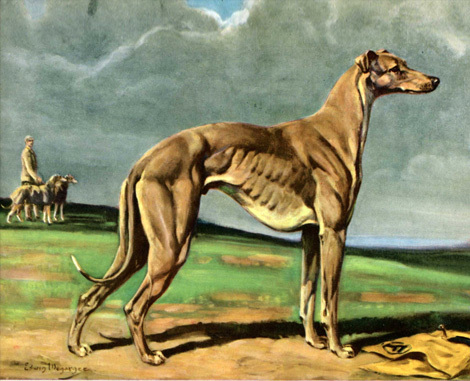 The greyhound was first imported to America in the late 1800s, and coursing events soon followed. Greyhound racing as we know it began around 1912, when Owen Patrick Smith invented the mechanical lure. This made racing around a circular track possible. The first circular track opened in 1919 in Emeryville, California. 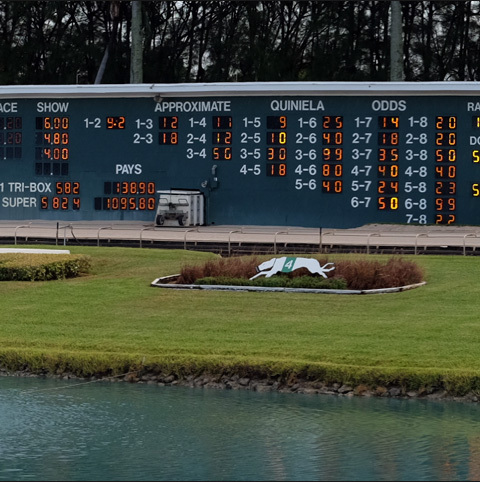 Pari-mutuel wagering was legalized in 1931 when Florida passed legislation allowing for both greyhound and horse racing. 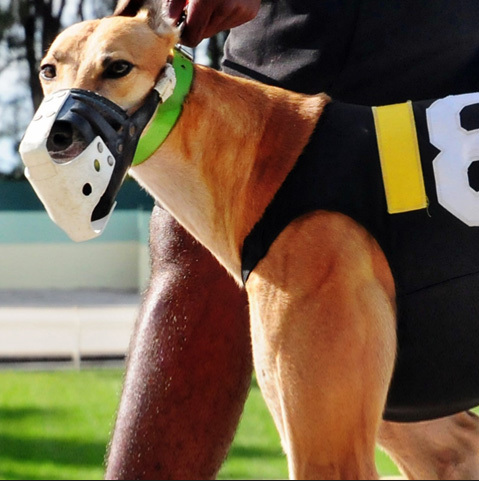 The newly established Racing Commission immediately granted operation permits for greyhound tracks, including Palm Beach Kennel Club, which opened in 1932. The greyhound is an animal born to run. Originally a hunting dog because of its speed, a greyhound will chase anything that moves. To run is the fulfillment of the greyhound’s basic interest and instincts. Greyhounds have a naturally gentle disposition and have always had a strong relationship with humans. 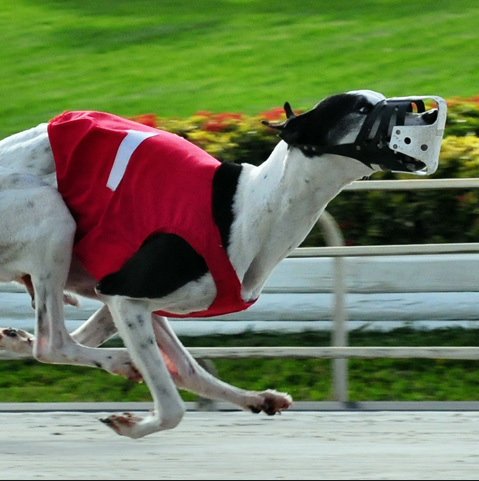 A racing greyhound begins its life after a gestation period of about 60 days. Litters generally range from five to nine pups. At birth, greyhounds weigh from three-quarters to 1¾ pounds, growing to a normal size of between 65 and 75 pounds within about a year. When a pup is three months old, it is given an identifying tattoo. All greyhounds are registered with the National Greyhound Association is Abilene, Kansas. The owner submits three possible names – no longer than 16 characters – in order of preference. If the owner’s first choice is not allowed by the NGA, the alternate names are considered. A normal breeding farm, where many pups spend their first year, consists of stud dog quarters, brood female quarters, whelping kennels, puppy quarters, exercise yards and kennel runs of various sizes. After two months, a greyhound gets his first chance to exercise his legs in a run. At 1 year old, pups begin training on a small schooling track where they are hand held and the mechanical lure is in sight at all times. As its ability progresses, a greyhound graduates to a starting box, longer racing distances and larger fields of competition. While still on the training track, a greyhound establishes his running style — inside or outside, early speed or closer. It is not uncommon for a dog to maintain the same style during its whole career. After training, the greyhound is sent to a racing kennel to begin its racing career. Each kennel has a trainer who is responsible for its care. A trainer might have 40-50 greyhounds in his kennel and attends to all of their needs. The trainer will get to know each greyhound by name and by their individual characteristics. A greyhound, like any other athlete, is well-cared for by its trainer. They are fed a diet that may include, beef, vegetables and high protein dog meal. Racing greyhounds must have a registered owner and race for a registered kennel. Every kennel enters into a contract with a track to race a certain number of greyhounds during the track’s season. Those dogs will run at the track and cannot run at another racing facility without permission. Because of this system, a close relationship develops between greyhounds and track personnel, who show pride in their dogs. 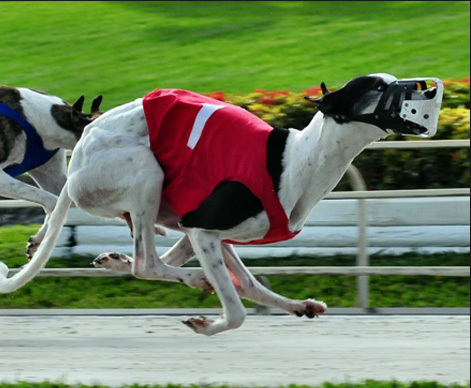 Track officials often grant permission of their dogs to compete in stake races at other racetracks. Two hours before post time, each greyhound is weighed. If its weight is more than 1½ pounds higher or lower than its set weight, it will be scratched. Before post time of each race, the paddock judge checks each greyhound’s tattoo and markings against identification records (Bertillion Card). These Bertillion Cards include 56 different identification marks, assuring the dog’s identity. 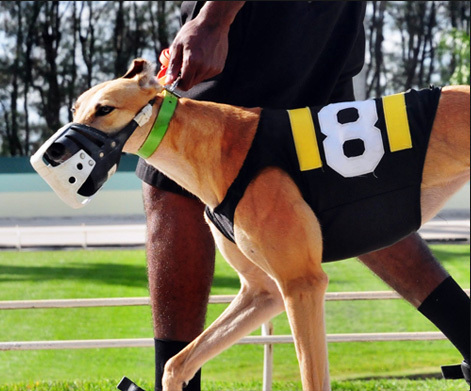 From the time they get to the track for weigh-in until the time they go back to their kennels after racing, greyhounds are under strict security provided by authorities representing the State Racing Commission, which regulates the tracks. Urine samples are collected by the state veterinarians and sent to labs to assure the absence if foreign substances. No greyhound can race under medication. A veterinarian is on the track premises during all races. The greyhounds are blanketed, paraded on the track and taken to the starting box, all in full view of the racing public. This ensures the interest of the betting public is safeguarded.